Isn't that the cheesiest line ever? Yes. Still, at times it's fitting. This post isn't really about Jerry Maguire, though that is a pretty good movie, I can only tolerate Tom Cruise in small portions. Is it just me or does he bug you too? Granted, he's handsome, but freakishly intense, no real depth or acting range and let's not forget the couch incident on Oprah. I used to think Renee Zellweger was just precious, loved her in JM, Bridget Jones, etc. Somewhere along her road to fame she started to believe that squinty eyes and the I Smell Something Sour face was the way to go. Anyway, like I said, this post isn't about that, it's about books. You know the moment when you open a book, eager to be swept up in whatever the plot is and imagine yourself as participating in the adventure right along with the characters? That is a heady feeling, my friends. Sometimes that feeling takes a few pages or a few chapters to hit. Other books might take longer to hook you, which is sad since we might give up on them before we discover their greatness. Some books just have you at hello. Instantly you know that the book is going to take you along on a fabulous ride and you find yourself giddy with anticipation. I've been fortunate enough to discover many novels that fall into this category, probably too many to list. Those books are the keepers, they deserve space on your overcrowded bookshelf. They are the books you want to shout their praises from the rooftops and share with your best friends (as long as they sign in blood that they will return them of course). These are books you might read again someday. This book had me at hello when I opened it this morning. I'm predicting a delightful read. My insatiable bibliophile-spastic self is now wondering which books had you at hello. I couldn't help myself from listing a few anyway, hopefully spreading the book love. 'A Fraction of the Whole' by Steve Toltz. Literally had me at the cover, and I plowed my way through it. Not for the faint of heart, though, and not G rated. But a fabulous piece of literature. I've seem the movie and I've been to the Mitford home in England, but amazingly, I've not read it, so I'll have to put in on my list. I love finding a really good book and just getting engrossed..such a stress reliever! Will definitely put your books on my to-read list! I just remembered I have A Fraction of the Whole on my to-read Goodreads shelf--hope to get to it soon(ish). 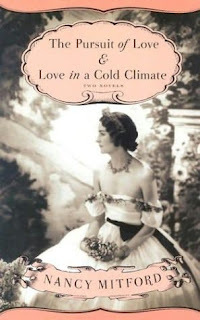 I'll have to treat myself to the movie of Love in a Cold Climate on Netflix when I finish. Thanks for the heads up. I liked Memoirs of a Geisha too, though I can't remember if I ever finished it. Oops. This is fun, keep 'em coming! I don't think I've read Snow Falling on Cedars, though I've heard lots of good things about it. I'll look for it at the library soon. I like Anita Shreve's books too, though I haven't read that one. I love it when a book gives me that "You had me at hello" feeling. It's doesn't happen often enough though. The Red Tent, Paul. BOth Biblically based fiction (loosely!) but interesting reads, nevertheless! Your book recommendations are always good. I will be checking on their library availability very very soon. Oh yeah, I second the recommendation for The Red Tent by Anita Diamont, very interesting and enjoyable. Thanks for the Paul book from the bunco book swap, I remember you saying how good it is. I'm sure I'll get there soon. Along this Biblical historical fiction vein, I want to recommend the Mark of the Lion series by Francine Rivers. It definitely had me at hello. I have only read the first one, Voice in the Wind, but was totally swept up in the life of the first century Christians--and Hadasseh's faith--what an example. i gotta remember to write these titles down!!! i was in the base library today trying to find the titles of a couple books i could remember. ended up with chick lit again. eek. and yes- tom is odd. but sometimes pleasant to look at...for short periods of time. and renee was cute for awhile...not so much anymore. so sad. ooohh, can't wait to read this one! my old stand by is the 'these is my words' series. love it! I'm going right now to put this new one on my goodreads list! The cover of the book says "Hello" to me too. So pretty. Can't wait for the book review! Love posts like these! And I think you and I have very similar book-tastes, so I am excited to read the Mitford novels. On my nightstand right now is "The View from Mount Joy"...which I would give a B+. Think I Can Handle This Without a Xanax?